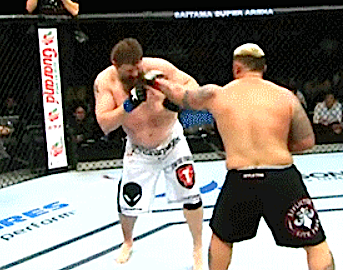 Big Country’s seemingly indomitable chin did not hold up against the Super Samoan, Mark Hunt, at UFC Fight Night 52 Saturday in Saitama, Japan. Set up with jabs, Roy Nelson ducked right into an uppercut from Hunt that sent him face first to the canvas in the night’s main event. Official time, 3:00 mark of round two. Also on the main card, Miesha Tate ground out a unanimous decision win over buff Pancrase champ Rin Nakai, who was making her promotional debut. By all accounts it was a rather lackluster showing by both ladies.